"I need to keep track of my progress. What should I do?" You can really boost your results by recording your progress in a notebook. What you want is a "top bound spiral steno book." It's just one of those notebooks with the wire spiral that holds the pages together. It works best if you have the wire at the top. The ones that are 6 inches x 9 inches (15 cm x 22cm) work best. They are big enough to write everything you need but small enough to put in your gym bag. Get one with about 60 or 80 pages. It might get some rough wear at the gym or by getting tossed around in your bag. With 60 or 80 pages it won't get too worn out before you fill it up and need a new one. Also get yourself some mechanical pencils. Get the kind you throw away when they are empty. You won't be writing too much, so they last forever. And you don't have to worry about sharpening them. If you are at an office supply store you should pick up a couple of banker's clips. There are like really big steel paper clips. They will hold your pages together. 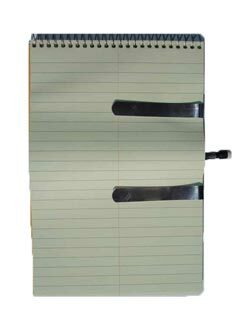 So you can put the clip on the notebook and then just toss it down and the pages don't tear off. If you have two of the clips you can slide your pencil in between them and it holds it and the pencil won't fall out. The notebook is such a simple thing. But so helpful. When you use it, it will double your results from exercise. And triple your weight loss. Keep notes of your exercise -- duration, sets and repetitions. Note down what you are eating. It just takes a second.